What are cache profiles and what to choose in Air Live Drive? What are cache profiles and what to choose? 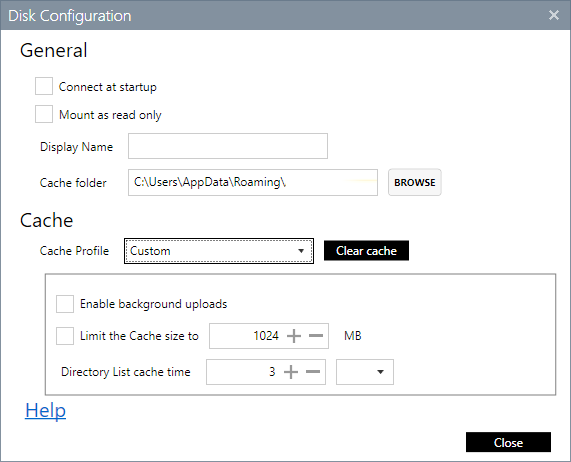 Cache profiles allow you to customize the cache features. Depending on the profile you choose, the program will work at maximum speed or in real time. If this option is enabled Air Live Drive will save the added or modified files in cache first and will upload them later to the cloud in background so you don’t have to wait to continue working. You can monitor the uploads with the uploads list. Air Live Drive caches the most used files in the cloud so it does not need to download them each time the file is opened. To limit the amount of space Air Live Drive uses in your local disk you can limit the size of the cache. It is recomendable to configure a value higher that the files you plan to use frequently. Air Live Drive keeps a cache with the list of files and folders in the cloud. You can configure how often this list is refreshed. If you don’t plan to make changes in the cloud using other software or the web page a high value will speed up Air Live Drive. However if you do changes in the cloud outside Air Live Drive it will take same time for Air Live Drive to reflect those changes.